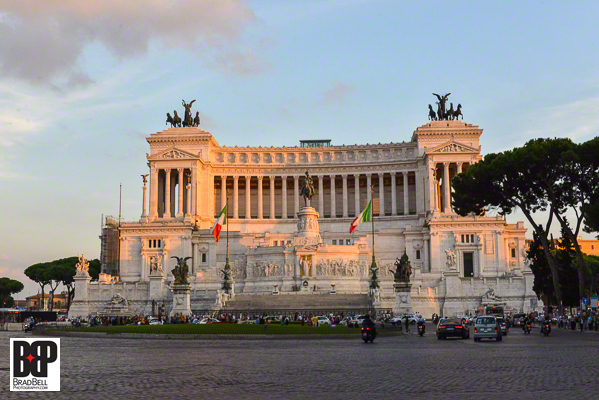 Rome wasn’t built in a day, but one day was all we had to shoot the iconic sights and find the best restaurants. 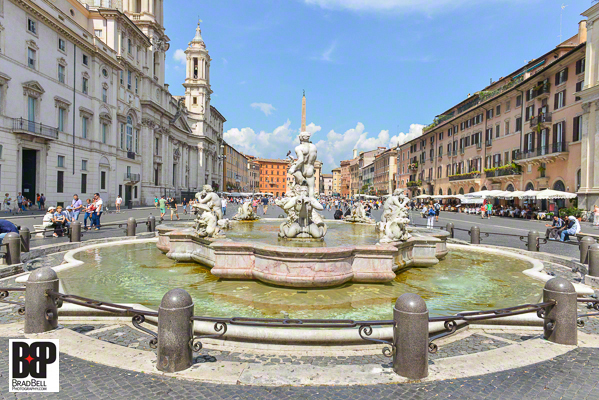 Fortunately I have been to Rome a few times before and know the historic center reasonably well so I knew exactly where I wanted to be to get the photos I wanted. The unfortunate thing is that one never knows when the monument or cathedral you want to shoot is going to be covered in scaffolding and being restored or cleaned. I can’t tell you how many times I was psyched up to shoot the Duomo or Palace only to turn the corner and see the entire building under restoration and impossible to shoot. There is no way to accurately predict this scenario unless you can find someone who has very recently been to the exact same location and would have noticed the status of what you want to shoot there. One tip is to search the internet for photos from other photographers who were recently in the same location. Sometimes you can find their email and actually ask them what was what. 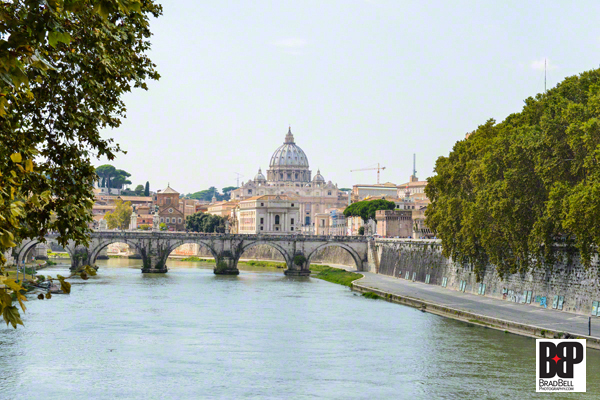 Because it had been 7 years since my last trip to Rome, I was looking forward to shooting the iconic sights again with my current gear that produces much higher quality images. The famous Trevi Fountain has always been one of my favorite sights in Rome. It is literally the back wall of a city building so you cannot see it until you turn the corner into the piazza. I can’t tell you how disappointed I was when we turned that corner. 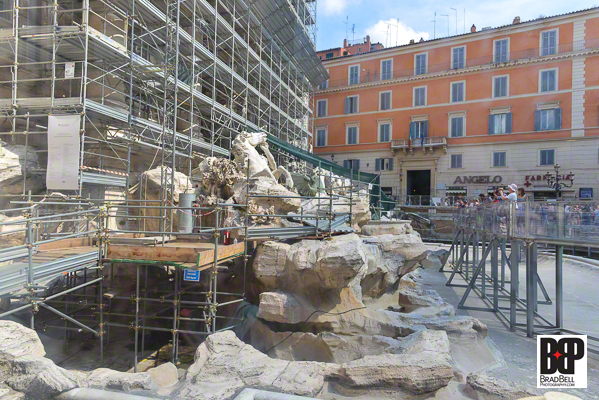 Believe it or not, that’s Trevi Fountain under the scaffolding. 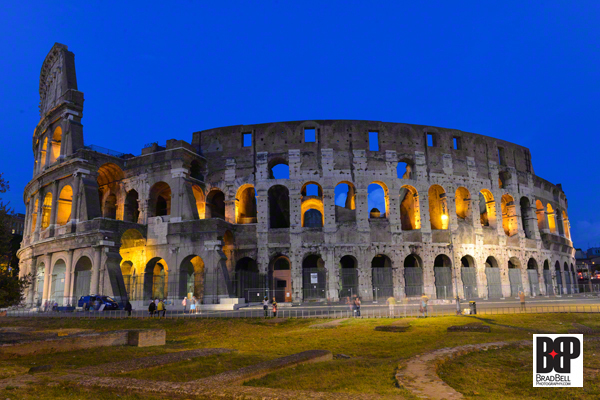 Not only was the Trevi Fountain covered in scaffolding but so was the Coliseum! Seriously? We’re in Rome for a day, the weather is perfect and both the Trevi and Coliseum are undergoing renovations! As you can see, there was absolutely nothing I could do to salvage a shot of the fountain. The Coliseum, however, was a different story. Fortunately there was an angle, probably the best angle that the Coliseum could be shot from, that hid the scaffolding completely. Luckily that was exactly where I wanted to shoot it from. Our flight home from Rome departed at 9:00 a.m. and the airport is an hour from downtown so we would have to be up and out early. Rome is the most impossible city I have ever seen to try to drive in. We have done it but it wasn’t pretty. 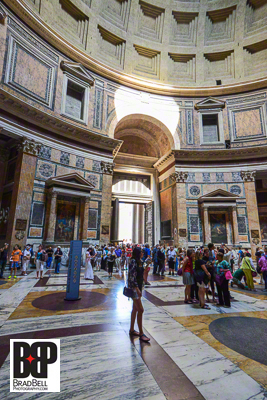 So when we left southern Italy for Rome, we went right to the airport to return the rental car and hopped in a taxi for downtown. By the time we got checked-in and made dinner reservations it was time to hop in another taxi with gear in tow to get our first twilight photos of the Coliseum. Fortunately we knew exactly where to go and claimed our position amongst the hundreds and hundreds of tourists, other photographers and even newlyweds having their wedding photos taken there. It didn’t take long to get the perfect twilight photo with a glowing blue sky. I was happy as we headed to dinner. As I mentioned in Part I and Part II, this trip was put together very quickly. The first thing we did when we arrived in Italy was purchase a local SIM card with data for my cell phone. I instantly had a mobile hotspot with internet access on my cell, iPad and/or laptop. Being able to research restaurants in the car while following GPS directions at the same time was a real time saver for us. 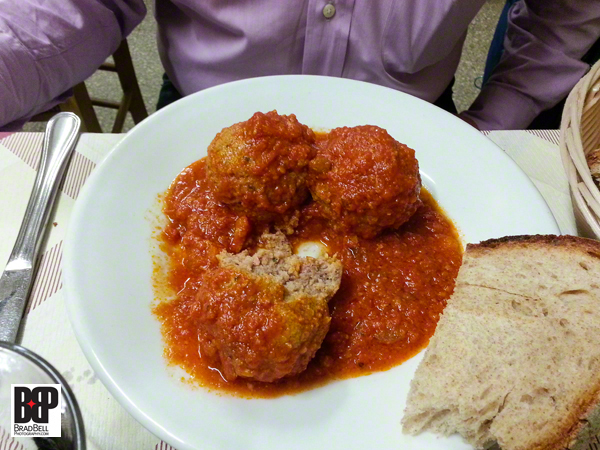 We discovered the best new restaurant in Rome. The Concierge at our hotel attempted to get us a reservation but they were full for the night so we decided to just show up and play it by ear. Knowing there would be a wait at the very least, we walked up to see a line of people waiting in front. We gave the host our name and he told us the wait would be 45 minutes so we went down the street to have a drink while we waited. Almost exactly 45 minutes later we were seated in the tiny 8 table restaurant with a few tables outside in the street. 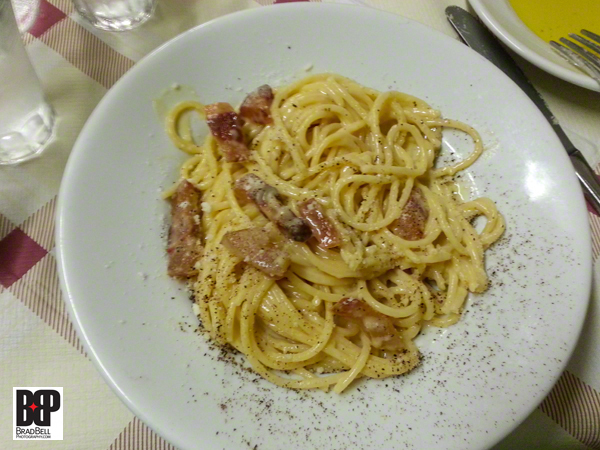 Not found in any guide books and completely unknown to the Intercontinental Hotel’s Concierge staff, Da Enzo in Trastevere is a true gem hidden by locals for fear of tourists discovering it. Farm to table with all completely organic ingredients, the food was fresh, amazingly flavorful and quite possibly the best we have ever had in Rome. 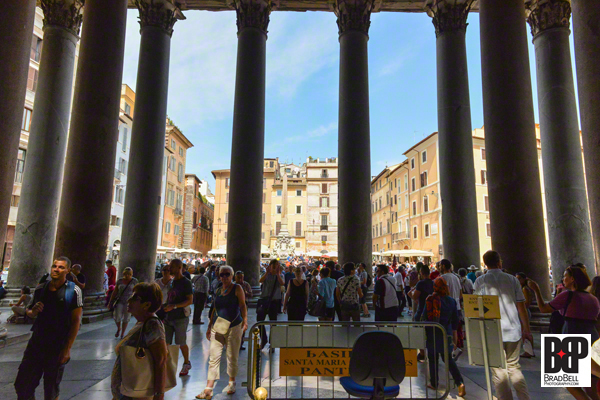 The columns at the Pantheon. After scouting some locations during our busy day in the city, we knew exactly where to go our last night for an attempt at 2 twilight photos from the same bridge. 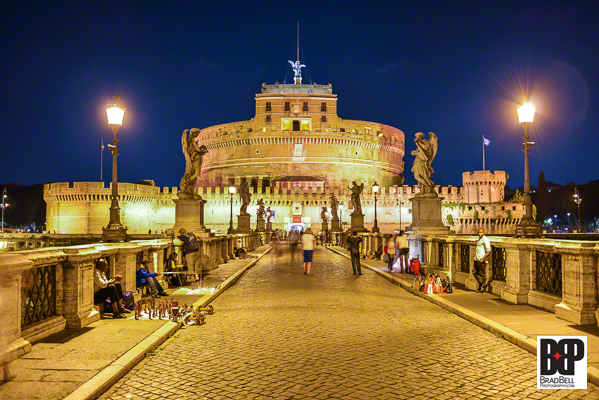 Angel Bridge gave us the perfect perspective for an evening view of St. Peter’s Bascilica in Vatican City as well as Castel Sant ‘Angelo at the end of the bridge. A young violinist serenaded us as he played classical music for tips on the bridge as tourists passed by. It was truly a magical moment as the light reached perfection and I captured it in my camera. 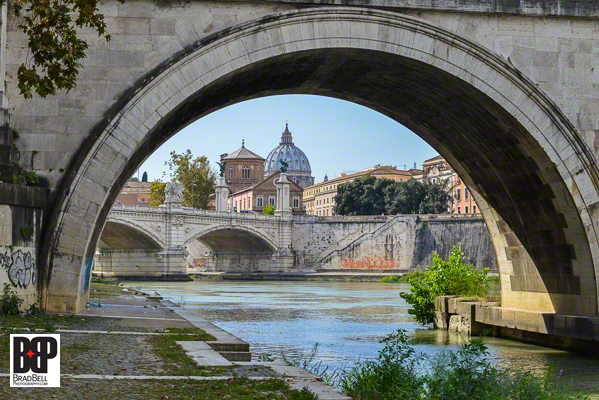 In 24 hours we were able to create 3 images of iconic sights in Rome that we would always remember. What a successful, last minute trip to Italy! This entry was posted on October 3, 2014 by Brad Bell Photo. It was filed under Europe, Italy, Photography, Travel and was tagged with BradBellPhoto, Europe, food, photography, restaurants, travel, travel photography. Oh my gosh! 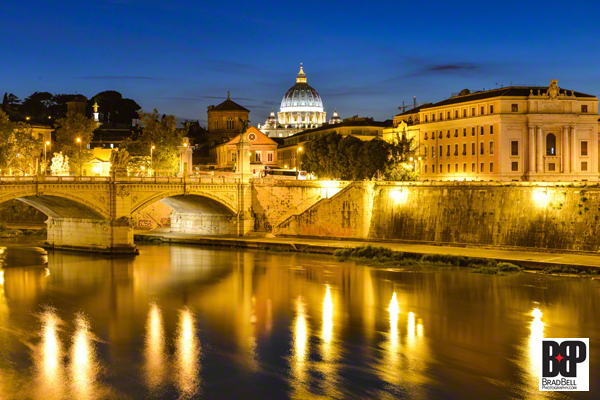 That image of the Dome of St. Peters is simply stunning! What an amazing series! Now…where did I put my passport?? ?